HID Global launched its enhanced FARGO HDP5000 High Definition Printer/Encoder. 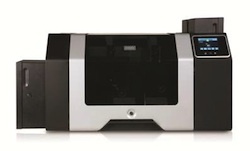 Featuring the company’s fifth generation of High Definition Printing technology, the enhanced HDP5000 now includes an expanded feature set and is marketed toward government, corporations and universities looking to produce IDs requiring color printing, card encoding and holographic security features on different technology cards. The HDP5000 printer/encoder features a new and brighter OLED graphical display that is capable of displaying a wide variety of different languages for use in emerging and mature markets throughout the world. For increased productivity, the HDP5000 also features increased card throughput speeds of up to 150 cards per hour and includes an optional dual card input hopper enabling for automatic switching between two different card types. Security is also enhanced with AES256 encryption and an option to erase data from resin print ribbons after a card has been printed. On the GSA list for FIPS 201 Approved Products, the HDP5000 is designed to help federal agencies comply with emerging federal secure identification directives and standards such as FIPS 201. The HDP5000 meets government security needs as illustrated by its continued adoption with the U.S. Department of Defense. The HDP5000 has also deployed several hundred to more than 1,000 units in Asian governments for their ID programs. Large businesses, such as Korea’s two retailers Home Plus and E-Mart, use the HDP5000 for issuance of their customer loyalty cards. With the demand for multi-functional student cards on the rise; hundreds of universities worldwide utilize the HDP5000 to issue student ID cards that can be used for physical access to buildings, logical access to networks, library checkout and other services, as well as cashless and debit card transactions on and off campus.